Boeing's design for a Deep Space Gateway, an astronaut outpost near the moon. 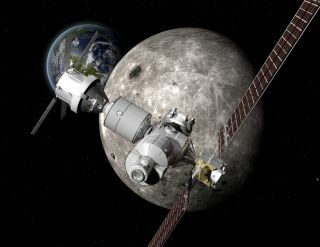 NASA is developing plans for a new Lunar Orbital Platform Gateway in orbit near the moon for future astronaut missions. DENVER — NASA is pressing forward on plans to build a Lunar Orbital Platform-Gateway, an outpost for astronauts positioned in the space near Earth's moon. Several hundred scientists gathered here between Feb. 27 and March 1 to take part in a Deep Space Gateway Concept Science Workshop that discussed how best to use what is billed by NASA as developing "a strategic presence" in cislunar space (or the space near the moon). "We invited scientists from a wide range of disciplines and thrilled with the breadth of science that's represented," said Ben Bussey, chief exploration scientist in NASA's Human Exploration and Operations Mission Directorate. "The different science areas are really embracing the idea of a human-tended Gateway around the moon and it doesn't compete with what they currently do. It represents a new opportunity for them," Bussey told Space.com. Even though the Gateway isn't science-driven, he said, NASA would like science to be performed at the facility and wants to identify what the Gateway could enable. A artist's depiction of NASA's planned Lunar Orbital Platform-Gateway. One thing is clear: Don't think of the Gateway as International Space Station 2.0. "It's a lot smaller," Bussey said, and would be an uncrewed platform that has a crew once a year. "It ends up being a very interesting orbit," Bussey said, with NRHOs now seen as a viable candidate for long-term cislunar operations and aggregation. "A Gateway in the vicinity of the moon has been the goal of scientists and designers of space exploration scenarios for almost two decades," said Harley Thronson, a senior technologist at NASA's Goddard Space Flight Center in Greenbelt, Maryland. More than a half century later, Thronson said, professionals at the Deep Space Gateway workshop discussed how a habitation system might be adapted to achieve multiple priority goals in space and Earth sciences. "The Gateway, as planned, offers some of the same advantages to scientists as the space shuttle and the International Space Station , although in a much different location," he said. Learning from the experience of NASA's space shuttle missions' servicing of the Hubble Space Telescope, astronomers at the workshop presented concepts for upgrading future very large observatories "or even one day actually assembling them in space, taking advantage of both astronauts and robots on site," Thronson said. This image shows four Near Rectilinear Halo Orbit possibilities for NASA's planned Lunar Orbital Platform-Gateway. The Gateway's unique vantage point permits astronaut operation of telerobots on the lunar surface, Thronson said. "The Earth itself could become a target of observation from the Gateway," Thronson said. "Remarkably, there have been very few whole-Earth observations from space that closely duplicate how Earth-like planets might appear to future astronomical observatories. A telescope at the Deep Space Gateway might accomplish this." An artist's illustration of the view from a deep-space habitat. "But we really don't have a lot of information about the value of doing lunar telerobotics from the Deep Space Gateway, as opposed to doing it from the Earth," said Dan Lester, a senior research scientist at Exinetics in Austin, Texas. Lester said that telepresence depends a lot on the cognitive load of what you're trying to do, and the price of modest control latency. "If you're trying to pick up a rock … probably not that much. If you're trying to tie a shoelace, it would make a big difference," he said. Some would say that telerobotic control from the Gateway, or from an Orion spacecraft, enables operation on the moon's far side, Lester added. On the other hand, it is cheap and easy to put a relay satellite at, for example, the Earth-moon Lagrangian point (L2) that would provide direct communications from Earth to the lunar far side. "[There's] no question, however, that the value of low latency telepresence for Mars is enormous, and implementation of that control strategy on the moon is exquisite practice for doing it on Mars in the future," Lester said. Just like the International Space Station today, where 15 different countries work together in space, there will be a role for international cooperation on the NASA's Lunar Orbiting Platform-Gateway. "The NASA Gateway Science workshop was a valuable meeting that highlighted the many opportunities that the Gateway presents for science," said James Carpenter, a strategy officer in the European Space Agency's (ESA) Directorate of Human and Robotic Exploration. "It is exciting to see the alignment of international ideas about the future of exploration and the opportunities that could be offered by the Gateway on our journey to the moon," Carpenter said. Not everyone is thrilled with NASA's Lunar Orbital Platform-Gateway plan. Zubrin did not attend the recent gathering, but in a recent Op-Ed piece he labeled the Gateway as a "boondoggle" that has a price tag of several tens of billions of dollars, at the least, and serves no useful purpose. "We do not need a lunar-orbiting station to go to the moon, or to Mars, or to near-Earth asteroids. We do not need it to go anywhere," Zubrin said. "There is nothing worth doing in lunar orbit, nothing to use, and nothing to explore," Zubrin said. "It is true that one could operate rovers on the lunar surface from orbit, but the argument that it is worth the expense of such a station in order to eliminate the two-second time delay involved in controlling them from Earth is absurd." "We are on the verge of having self-driving cars on Earth that can handle traffic conditions in New York City and Los Angeles," Zubrin added. "There's a lot less traffic on the moon."